For many of us, the word "philosophy" seems like a subject you might study behind a desk in an ivory tower, not an activity you might do while sitting in a circle on the floor of a kindergarten class. But to the passionate team of educators behind Philosophy for Children in Hawaii (p4c Hawaii), "philosophy" has become a verb. "Philosophy is something you do," according to Chad Miller, 2012 Hawaii State Teacher of the Year, "not something that is done to you." Based on the premise that philosophy comes naturally to children who wonder about lots of things, and that the very process of inquiry holds valuable lessons for becoming good thinkers, p4c Hawaii is quietly changing K-12 classrooms across the state. The opportunity to ask questions and ponder their answers in an intellectually safe environment is exactly what Dr. Thomas Jackson (aka "Dr. J") does each week, when he sits down with teachers and their students at Waikiki Elementary School. 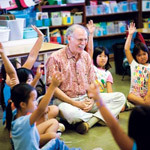 Since bringing p4c to Hawaii in 1984, Dr. Jackson has linked the resources of the University of Hawaii at Manoa with those of the Hawaii State Department of Education to help students understand why they think the way they do. What does this have to do with peace? "Everything," according to award-winning educator Amber Makaiau, Ph.D, "Because the process of figuring out what is true for each student involves learning from other students, often seeing connections that go deeper than differences." And what is peace if not mutual recognition and respect? The students pick the question and then toss the ball (literally) to each other, as they take turns sharing opinions—sometimes agreeing, sometimes disagreeing, but always listening to one another with respect. It's a process that, like peace itself, involves the ability to see yourself as part of a larger group—whether a class, a community, or, ultimately, a global village. The p4c Hawaii Center was the nation's first institution to employ a national board-certified teacher, Chad Miller, as a high school philosopher-in-residence. In addition to Chad, Ben Lukey, Ph.D has been working with more than 20 teachers at Kailua High School to integrate p4c into their curricula and transform their classrooms into places where students cannot wait to "do philosophy."